Over here on the Power View team, we’re pretty jazzed about the latest update to the Microsoft Power BI app for Windows 8.1 that just rolled out globally last night. 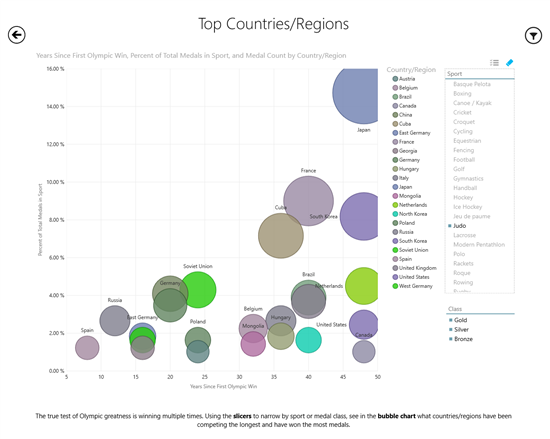 Now, anyone can see how Power View makes it easy to build maps, dashboards, bubble charts, and all of it is interactive by default. We’ve also been working hard to get our HTML5 Power View working – you can try that if you have an Office 365 subscription. Thank you to those of you who are tracking our progress as we fill out the feature set (we’ve seen your blogs). It’s very encouraging! Thank you! We know you might not yet have the latest version of Excel, so it might be hard to know what you’re missing out on. That’s where the Microsoft Power BI app for Windows 8.1 comes in; you can download and use the sample reports for free. I’ve added some screen shots below to give you a taste, but you should head on over to the Windows Store to see the real thing in action. 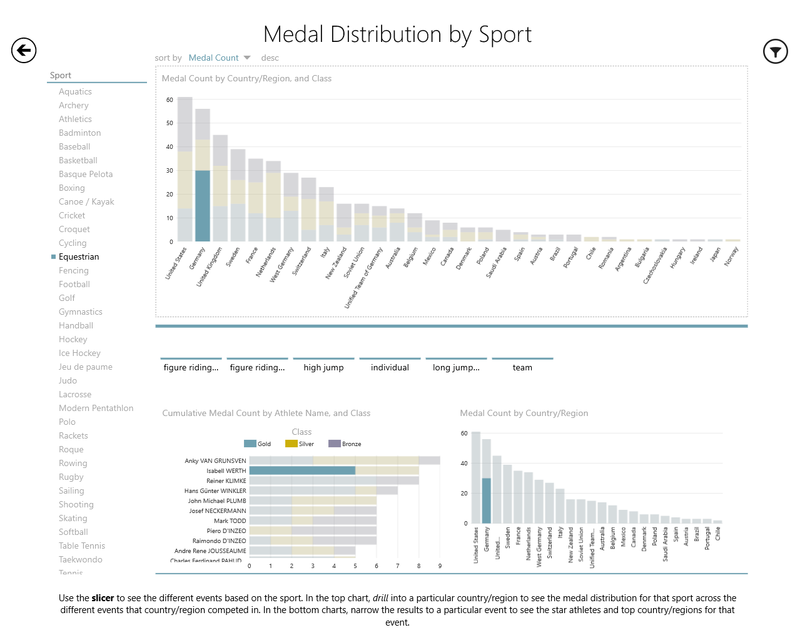 I’ll show you some screenshots of the Olympics samples that shows historical information across many sports. 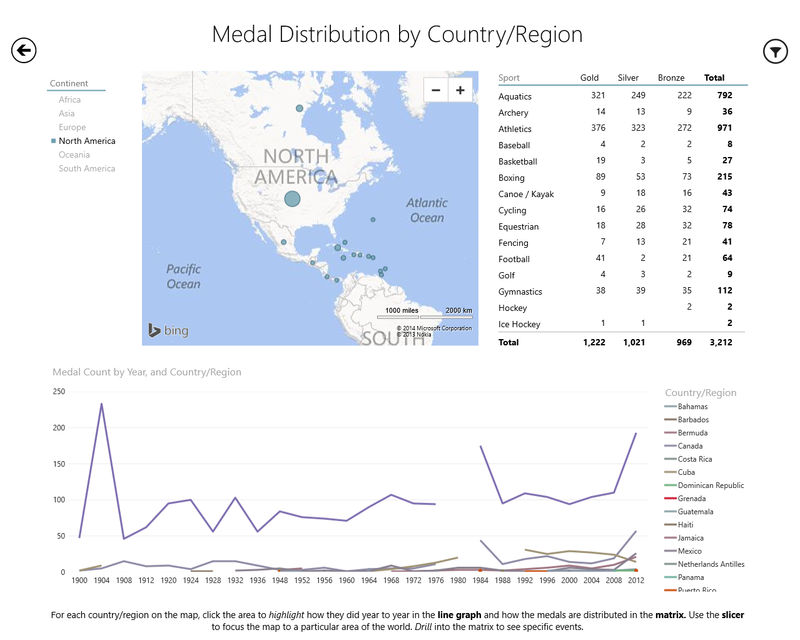 Here’s an example where I sliced the data for “North America” and was able to see the trends for how medals were awarded. I can see that the United States got the most total medals. But everything is interactive, so I can click on the map and see which medals the United States won. You should give it a try in the Power BI app. Here’s an example of highlighting working so you can easily see that for Equestrian events for Germany, Isabell Werth has won the most Olympic Gold medals. Lastly, below you can see that not only is Japan one of the most long standing Judo medal winners, they’ve won the most medals as a percentage of total medals awarded in Judo than anyone else. So there you have it – maps, bubbles, dashboards and a ton of interactivity. Try it for yourself – you can download the app here You can also learn more about Power View by watching the video below. We’re always eager to hear from you so feel free to post a comment or head over to the Power View forum to leave us a longer note.